Tinuku ~ Viar Motor has launched the latest variant of all terrain vehicle (ATV) type named Viar Razor 250 SUT (Sport Utility). 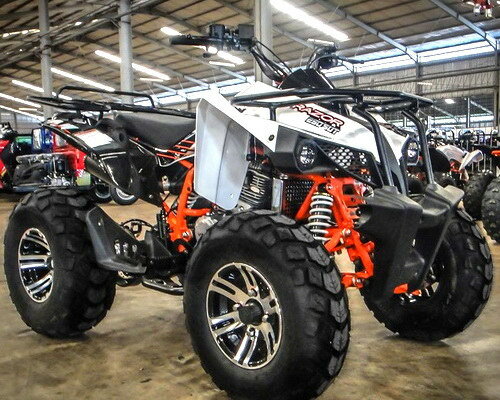 Commercial and adventure motorcycle maker based in Semarang City, Indonesia, intends to strengthen the existing ATV lineup is Viar Razor 100 SP, Viar Razor 150 UT and Viar Razor 150 SP. Viar Motor presents Viar Razor 250 SUT as an effort to fill the segments that are still empty or not worked well by big brands. Success through Viar Karya's commercial motorcycle, the company penetrated into the trail bike and is now seriously working on this type of ATV. Viar Razor 250 SUT is designed very sturdy on any side. Four-wheel motorcycle has two functions as utility vehicle and sport vehicle. Rear and front casting wheel has standard car quality and is claimed able to jump from height of two meters. The ATV features pure 223 cc single-cylinder engine, total weight of 164 kilograms, width of 1102 mm and length of 1650 mm. Ground clearance 95 mm and clear tough vehicles bulldoze all terrain for operations in mining, plantation and coastal areas.